When Caleb Jasper walks across the stage at commencement on Saturday, he’ll be the first in his family to earn his degree from NAU, despite being the youngest. Of course, the next three names called will be those of his two sisters and his mother, so it’s really more of a tie. 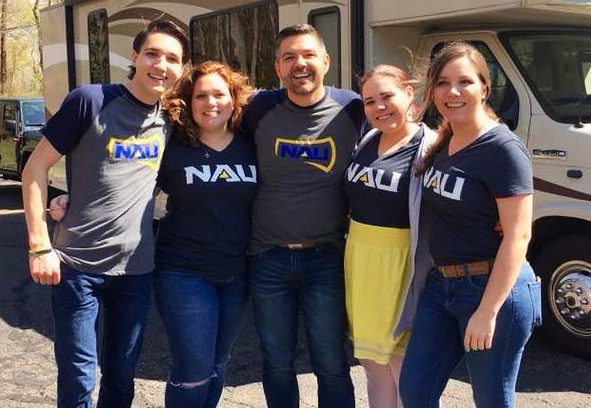 The family, who are from Long Island, New York, are all earning their bachelor of liberal arts degree through NAU’s Personalized Learning program. They didn’t start out intending to have a family graduation, leaving dad Jason taking all the pictures, but when they realized it was possible, the four Jasper students got to work. Mother Jerri Jasper was the first Lumberjack in the family. She realized a year or so ago she was finally at a place with her family and her job that she could go back to school and finish her bachelor’s degree. She looked around for affordable online options and found NAU’s Personalized Learning program. For $3,000, she could get a six-month subscription, enabling her to take as many courses as she wanted in that time. Shortly after Jerri started, her three children, who had started college through a dual enrollment program at Davis College in New York, were looking for a less expensive way to continue their degrees. They enrolled in the same program, also cranking out credits to finish in six months in addition to working part-time to pay for their subscriptions. Jerri said for about a month her husband, Jason, was responsible for all the cooking, home upkeep, laundry and everything else, including his full-time job as a pastor, to make sure they could all finish. The children had always been home-schooled—Jason worked in Kosovo when Hannah, their oldest, started school, and there were no English-speaking schools, so Jerri taught her, continuing to do so when they returned to the United States—so this learning environment was familiar to the family. Hannah said she leaned on Caleb’s knowledge of math and science and Leanna’s knowledge of film to get through some of her classes. She also relied on her father’s knowledge of time management; he helped her create a schedule so she could get all the work done on time. She also found help from her NAU mentor and instructors, particularly when she found herself close to the end of her subscription. As for what’s next: Flagstaff is one stop of their yearlong North American RV tour. The family is taking a gap year together, living in a 31-foot trailer and exploring the United States, Mexico and Canada. Leanna, 20, said she’s looking forward to exploring museums, aquariums and all of the unique and beautiful sights each state has to offer. Along the way, they’re all hoping to do a little soul-searching. Jason said each of them has considered graduate school, Jerri especially, but that may or may not be next in line.